I feel like I should make some excuse for why I’ve neglected to post anything for the past (what has it been?) two months. Now that the holidays are winding down, I do feel like there’s a little bit more breathing room. When I haven’t been at my day job, I’ve been doing a fair amount of felting, thanks in part for a little mention in the Dec./Jan. issue of Knitting Today!, as well as the aforementioned opportunity at the Walker. But, that all seems like old news. 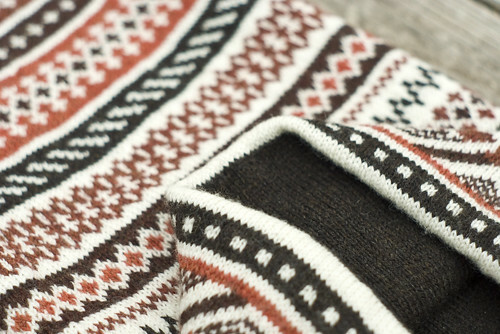 The flurry of wool and needles and boxes and shipping labels has calmed. 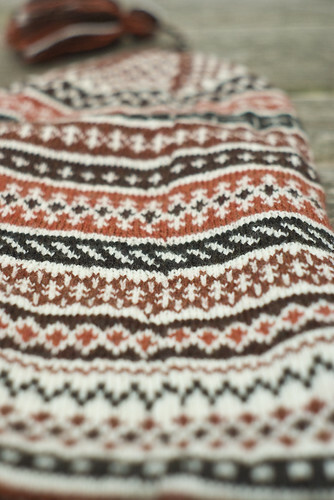 The real reason why I wanted to get back to this blog was to share this amazing knitted gift I received from Virginia. It’s a hat that even the coldest, most bitter winds of winter cannot penetrate. 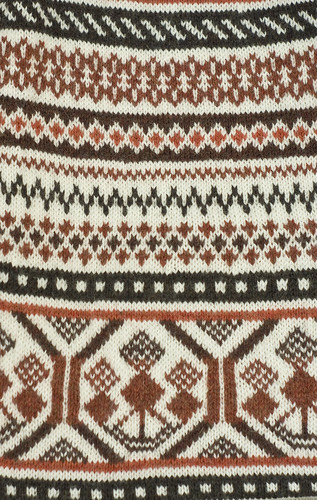 The Fair Isle pattern is from Japanese designer Toshiyuki Shimada, in the book Northern European Knit Accessories. I thought this would be a fitting piece to share, as both a bit of fireworks to end out this year, and also a bit of inspiration for the one around the corner. So, here’s to a craft-filled new year, with motivating projects, exciting challenges, and plenty of good cheer. 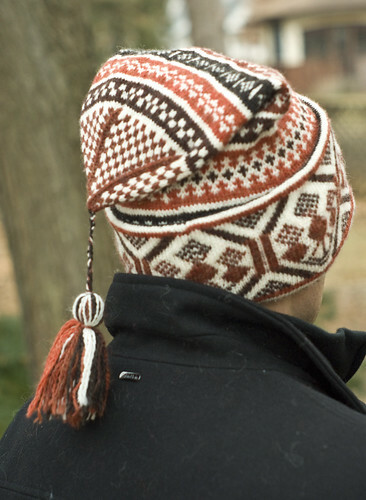 And what an amazing knitted hat. Truly gorgeous. Yes, way to get the ink. Is there a link to the piece on line? Regardless, GREAT. Glad to see you guys at the November sale. Can’t wait until next year. Stunning V!! You’re a lucky guy, Dan! And, wishing you all good things for the new year: peace, prosperity, adventures, and lots of fiber! What an amazing hat you got from Virginia! Beautiful work, Virginia! 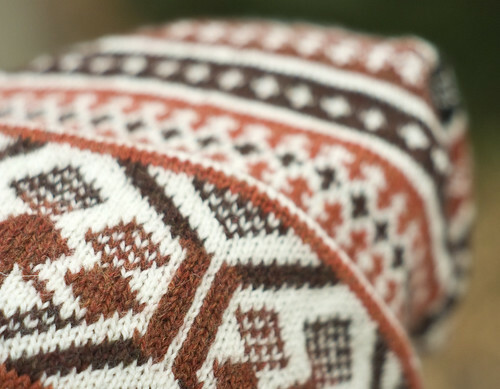 I LOVE your designs, and the owl who is knitting is just amazing. 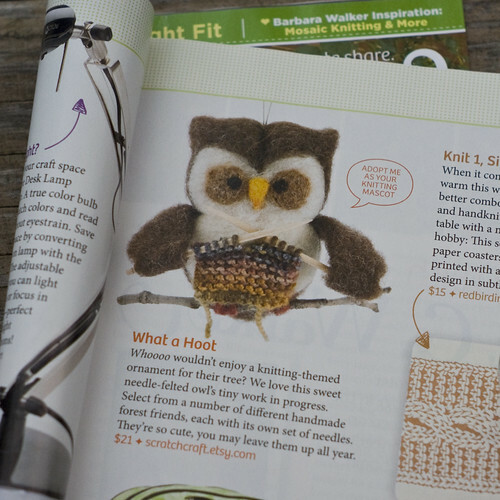 What a unique product, showing your knowledge of knitting as well as needle felting and cute animal sculpting. Wonderful work! I wish you a very lovely 2013, Virginia!